Orleans is an actor model framework — a framework used for easily creating distributed systems across a cluster of machines. In this post we’ll explore the “Reminders” feature of Orleans. in order to send “Fake email” everything’s ok notifications. Starting from https://github.com/Kritner-Blogs/OrleansGettingStarted/releases/tag/v0.40, we’ll enable the in-memory reminder service by adding the following line to our ISiloHostBuilder. Some other possible reminder services to use include AzureTableReminderService and AdoNetReminderService. The Grain Implementation — also Grainception! 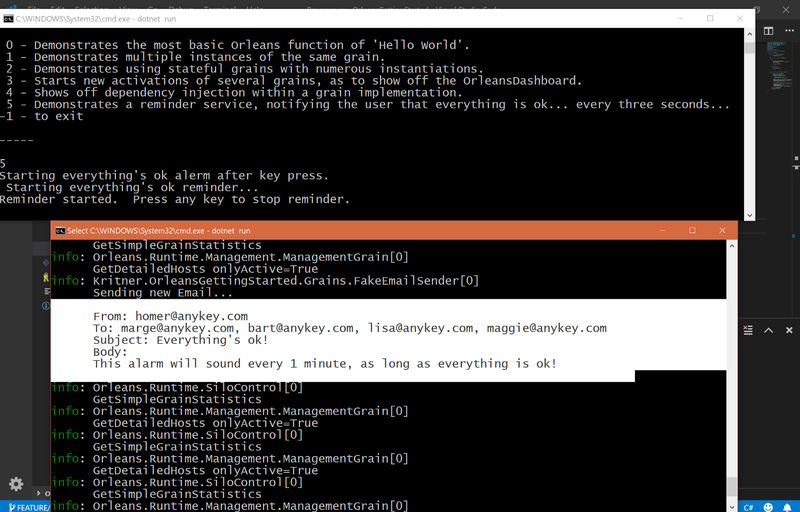 As I mentioned previously, we’ll be using the FakeEmailSender created from a previous post, as well as having our to be created grain utilize other grains (grainception)! "This alarm will sound every 1 minute, as long as everything is ok!" [StorageProvider(ProviderName = Constants.OrleansMemoryProvider)] — we’re making the grain stateful so (theoretically) the reminder will persist on shutdown. Note, it will not in our case because of using in memory storage, I *think* it would otherwise. IGrainReminder _reminder = null; — holds reference to our started reminder, used for stopping the reminder. Task ReceiveReminder(string reminderName, TickStatus status) — this is the method where we actually define what happens when the reminder occurs. var emailSenderGrain = GrainFactory.GetGrain<IEmailSenderGrain>(Guid.Empty); — here we’re using a slightly different means of retrieving a grain, since we’re actually doing it from the SiloHost, rather than Client. Note that this grain being pulled also makes use of dependency injection, but its dependency is only injected into the grain that actually needs it, not this reminder grain. as per usual, we’re going to create a new IOrleansFunction concretion for use in our menu system; that new grain will also be added to be returned from our IOrleansFunctionProvider. As per the norm, we’ll be starting the SiloHost, the Client, and trying the new grain out. In the above, you can see that our “FakeEmail” went out to the Orleans log, stating that everything’s ok.